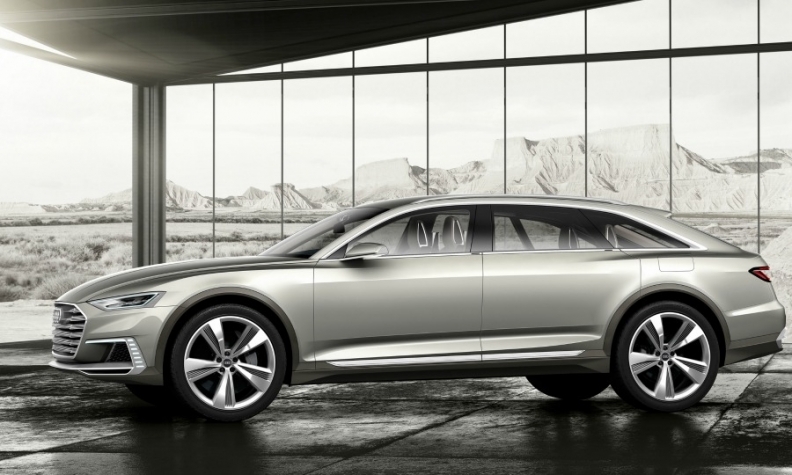 The A8 is expected to use styling cues from the Prologue concept, pictured. INGOLSTADT, Germany -- Audi expects to be first automaker have a production car capable of Level 3 autonomous driving with its upcoming A8 flagship sedan, which will go on sale later this year. However, the feature will not likely be immediately available at launch, because few governments are passing new laws that provide legal certainty. Such a law is currently under discussion in Germany, one of the first countries that plans to apply an amendment to the 1968 Vienna Convention on Road Traffic allowing Levels 3 and 4 of autonomous driving. Currently the law only needs the approval of Germany’s upper chamber of parliament, which could happen in a matter of weeks. The government’s draft foresees a declaration from the manufacturer to the customer that spells out exactly the circumstances under which a driver can transfer control of the car, so there are no false expectations. Additionally a black box will record all handover protocols so crash investigators can know whether a human or a computer was in control of the vehicle at the time of a collision. The A8's Level 3 feature, called "conditional automation" by the Society of Automotive Engineers (SAE), will operate at speeds of less than 60 kph (37 mph) in heavy congestion on highway roads physically separated from oncoming traffic. Once drivers engage Level 3, they can read a book, stream the morning news on their tablet, or reply to emails. Taking a nap, however, is not possible because when a traffic situation requires their attention, the car will request a handover protocol, usually giving the driver several between eight to ten seconds to assess the situation on the road and retake control of the wheel. At the automaker's 2016 results press conference last month, Audi CEO Rupert Stadler said the A8 will offer the feature when governments the automaker's core markets allow it and when that is legally safe. Cars that currently claim to offer hands-free driving such as Tesla’s Autopilot are classed as Level 2 or "partial automation." The driver must watch the road at all times and be ready to take control in an instant. The face-lifted Mercedes S class, which is due to go around on sale the same time as the new A8 in the autumn, will offer advanced autonomous features but not Level 3 technology. The technology "is not at the level where we would flip the responsibility completely from the driver to the vehicle," Daimler development chief Ola Kallenius told reporters at the Geneva auto show last month. "We want to take a few more steps before we're willing to pass that torch." The face-lifted S class will offer "a very, very sophisticated Level 2 system," Kallenius said. Daimler says the upgraded S Class will have a feature that will help the driver steer into bends by slowing and accelerating the car even in non-highway driving. It will also be able to change lanes autonomously like the E class. Daimler has entered into a development agreement with Robert Bosch to bring Level 4 and Level 5 driving to urban roads by the beginning of the next decade. BMW says its iNext car due in 2021 will offer Level 3 automated driving. Technically, BMW will be able to equip the car with Levels 4 and 5, the company's senior vice president for autonomous driving, Elmar Frickenstein, told Automobilwoche, a sister publication of Automotive News Europe. But no decision has been taken, he said. At the Geneva auto show in March, BMW CEO Harald Krueger ruled out that the automaker would move directly to Level 4 autonomy from Level 2, as other carmakers such as Ford and Volvo are currently considering. "You learn what happens, what works and where improvement is needed," he said. Level 4 is classed as "high automation" by the SAE. The car does most driving functions but the driver can take back control. In Level 5, or "full automation," the vehicle does not need a steering wheel and the car can perform all driving tasks.